I took a break from computer games for a bit… I did manage to show up last Monday for the guild’s Blackrock Foundry raid, but that’s been it. Overall it was a successful night. We downed 4 bosses: Gruul, Darmac, Hans & Frans (Hans’gar and Franzok), and Flamebender Ka’graz. I hadn’t seen Ka’graz before, so that was good – it is always fun to see a new boss fight! As a healer my job was the usual keep the DoT’s going and avoid fire. I gather there was more to do as tank and DPS, since we would get occasional roving flame hounds (they looked pretty cool) and someone would call to “group up”. Hence the screenshot where we are all standing in some sort of bubble. Glynneth’s item level remains at 665 – I am hoping to upgrade my pants as that item is currently my lowest (at 640). My WoW sub it up next week, but I’m going to renew for another 3 months. So in Aug I’ll be thinking about this again. I let my EVE sub expire. It’s a great game and all, but I can’t play enough to make it worthwhile. Especially since there is certain fixed overhead as far as time spent in game goes – just getting from one place to another, scanning to exit the wormhole, dealing with PI and hauling goods to market. Wildstar… well I extended another 3 months so I’m paid up until the end of Jul. It’s a fun game as well, and who knows, by then it might have dropped its sub or whatever the latest rumors are. If it doesn’t drop its sub, I will probably not extend. This is not about the money. Really, I spend $15 a month at Starbucks every month. Or more. Just last week I went to see the Avengers with some friends and my ticket was $13. MMOs are pretty efficient as far as cost per hour of entertainment. What it is about, for me, is comparing against equivalent goods. I’m not sure of the precise economics term, it would be some combination of utility and substitute goods, but WoW/EVE/WS are not in competition with me going to the movies, my Netflix subscription, or what have you. They are in competition with each other, any MMO that charges a subscription, and any MMO that is B2P or F2P. I’m willing to throw in some money to an in-game store if I like a game, for cosmetic stuff or what have you. So for me, that ~$15 a month towards a sub game is money I could be funneling towards a game I enjoy more. Which in my case could be TSW, ESO, LoTRO, GW2, etc. Actually, I haven’t been playing those much either lately – taking a break and all 😉 – but I do plan to reorganize and cull some games. Basically, out of curiosity I keep a log of how many hours a week I play MMOs. The result was: I average about 6 hours a week these days. And 3 of those are WoW due to the raiding my guild does. This ties back into my perceived value for time and so on tradeoff: at ~3 hours a week, playing EVE is pointless, that game needs more like 15+ hours a week just to keep an income flowing and take care of logistics that are forced on you, the player, so you can do other fun stuff. At 3 hours a week I could farm planets and sell goods to stockpile ISK I don’t have time to spend on ships to do other stuff. While I do enjoy Wildstar, ~3 hours a week means me soloing to the end-game and then, well, not having time to do much of it. The chances of me finding another guild, semi-casual enough to be OK with me raiding one night a week, having a raid spot for me, doing it during convenient hours (8-11 pm, about as good as I can expect), etc. trends towards zero. If it happened, I would consider a switcheroo – unsub WoW in favor of WS. But again, it’s a ways to the level cap for my WS char, and I’d need to gear, attune, find a guild, etc. Not impossible but many structural roadblocks along the way. Therefore, almost by default, WoW is filling that “group content” slot I have time for. Yeah, all the criticisms of the rest of the gameplay, from unused dungeons to repetitive quests to garrison tedium to dull class design – all valid, but I don’t worry about any of that stuff because it doesn’t affect me. I’ve slimmed down garrison time to sending followers on gold missions and cut out all the resource queuing/gathering/harvesting because I don’t need it. Well, I stopped that after I crafted myself a Stone of Fire. I’m probably not typical in what I want out of WoW, but playing 3 hours a week and spending all of that doing end-game group stuff is essentially the best ratio of time to actual fun in a game I could have. I pop into my garrison twice a week for less than 15 mins each time (I round that down to zero) and get summoned everywhere else. Contrast that to EVE where it takes 45-90 mins just collecting PI goods and going to market to sell them. And any inattention is risk for getting killed. The question then becomes, how to best spend the rest of my available time. I’ve got more games than I have time to play. Keep pecking away in TSW, play another game if I have some extra time available? That seems like the most realistic, and given my recent gaming, the two I would most likely play with spare time are TSW and ESO, with a smattering of LoTRO tossed in there. All are solo-friendly and enjoyable to me. And I will spend some money in each in-game store to vote with my wallet, as the saying goes. I do feel a pull to check out new games, however. I see Marvel Heroes on Steam, and lots of good press about Final Fantasy 14: A Realm Reborn. The problem with FF14:ARR is that it is a sub game, so given my spare time it would be silly to take it up while I have a few months on WildStar already paid for. I haven’t played WoW in a few weeks. By that I mean anything more than ~15 mins of garrison maintenance, every other day. I had other events crop up on the past few Mondays so I missed my weekly timeslot – the guild raids M/W but I usually can’t make Wed anyway. What I had been doing garrison-wise was harvest frostweed in order to keep the work orders at my alchemy lab full. Those work orders generate alchemical catalysts, a material for transmutation and creating of the Stone of Fire. Anyway, I was able to make this past Mon, for the first time in a month… and it was fun! Since I hadn’t been there for a few weeks, I was a little behind on gear and thus received items everyone else passed on. The evening resulted in 3 big gear upgrades for me, and one side-grade (I replaced a slightly higher heroic item with a normal item that had a prismatic slot; basically trading single-digit stat decreases for a nice +50 secondary stat bump). The big score was moving up from my garrison-mission 645 weapon to the 670 Inferno-Flame Staff from Gruul! We had trouble with Oregorger, but are getting better. By that I mean we usually get to phase 2 of the fight and more than half the raid survives for the 2nd phase 1. 😉 We used to barely get him down to 85% and now we are consistently getting to 50%-ish before calling it due to most of the raid being down. To wrap up, we fought a boss I hadn’t seen before, Beastlord Darmac. He provided the previously mentioned side-grade and I hope the next time he is generous and gives me better leggings. Glynneth is now at item level 665, which is stratospheric to me, since I never imagined gearing up this well. My leggings are currently my worst piece of armor at 640, the next lowest are a few 655 items. I can also improve a ring by finishing the legendary quest line. But for now I’m doing pretty well. My guild does “achievement runs” every other Sun and I make it a point to attend those since everything is new. The recent run was to do Siege of Orgrimmar on Mythic difficulty. Even though we were 10 levels higher and over geared, it still wasn’t “easy”. I can’t imagine how tough this content was at the old level cap. The first boss was a water giant named Immersus, and we literally lined up to fight him due to the encounter mechanics. Unfortunately, we only downed 10/11 of the bosses in Siege of Orgrimmar; we wiped 3 times on the final confrontation with Garrosh Hellscream. Since he is the last boss and it was late, we called it with plans to return next time to finish him off. By then I can read up on the encounter mechanics, since twice I died during the intermission phase in the Realm of Y’shaarj, and I’m not sure how to avoid whatever got me. I was just standing in the wrong place, the classic thing to fail on. 😉 To be fair, I was unfamiliar with all of previous steps and was generally able to stay out of the fire and contribute my healing portion. Perhaps on mythic difficulty some of the mechanics require advanced knowledge since they hit too hard to figure out what to do during the encounter. The guild on Earthen Ring is awesome in that there is an active group that likes collecting achievements. This is ideal for me because that means going back to earlier content to finish of raid tiers, even though we are all over-leveled. It makes most fights quick but they are still fun. For me it is great because I haven’t seen about 98% of that content. Sun evening we got a group of 10 together to visit Pandaria’s Heart of Fear and Throne of Thunder raids on heroic mode. Most fights were quick, and so were most bosses but some of the mechanics still tripped us up and we had to do a few fights more than once (i.e. we wiped). But that was rare, basically we had to make a few tries at the Dark Animus and Ra-den. For a bit of variety I switched into Spirited Crane stance to do a little DPS while still being a healer, but I decided it was easier to just stay in Wise Serpent and throw an occasional Crackling Jade Lightning. It turns out the guild does one of these achievement runs twice a month. That is great timing – not too much commitment overall – and I’m getting to see more content in WoW than I ever thought I would. My new monk Glynneth (Glyneth was taken, argh) took Jewelcrafting and Alchemy as her two professions, so my first two small garrison buildings were the Gem Boutique and Alchemy Lab. I find those two professions to be a nice mix of usefulness and ease of gathering raw materials – basically everything I’ll make comes from resources I can gather in my own garrison. After some experience with Suldrun on Gorgonnash, I realized that Herbalism is a waste – the garrison herb garden is usable without Herbalism so there isn’t any need to gather in zones. Having it will let you get more herbs faster, but the herb garden supplies me plenty for the volume of potions I craft. Characters can only have two professions and Herbalism doesn’t carry its weight. Actually, I think that all gathering professions are a waste in WoD: herbalism, mining, skinning. Yes, skinning. How to gather leather? With a barn – is much much faster than via skinning! I had skinning for a while, using it on every skinnable mob I killed, collecting scraps. The conversion is 10 scraps to 1 hide, and 5 hides for a work order (e.g. 50 scraps for 1 work order) – so dozens of mobs for one lousy work order. Or, with a barn, trap one Clefthoof in Nagrand for a work order. It is literally 10+ times more work to skin for leather. I get the feeling that Blizzard might be not-so-subtly getting rid of gathering professions. I always thought it was lousy you had to take gathering professions when you could only have 2 overall – it would have been better to allow 2 production professions and 1 gathering profession. But with how WoD crafting recipes are craftable with a skill of 1 (thus not forcing everyone away to gather in low level areas) and the raw materials come right from your private garrison instance, why have them at all? On the Earthen Ring garrison, my first medium building was the Lumber Mill, which lets me gather timber and produce garrison resources. Hence, my garrison grew faster than the one on Gorgonnash because I wasn’t blocked waiting for resources as much. When I finished the Gorgorond quest that awards the Outpost Building Assembly Notes, I used that to upgrade my Lumber Mill to level 2 in order to collect medium trees ASAP. When I upgraded to a level 3 garrison, I built a Dwarven Bunker (to outfit followers and get a free Seal of Tempered Fate each week), a Barn (for leather/cloth and eventually savage blood), and a Tannery (create armor). Whenever possible, I assign followers to each building to boost output – one very important combo is a skinning follower at the Barn, and a leather working follower at the Tannery. My favorite technique when fighting a boss with a bunch of adds: put up the statue, move to the side, then taunt the boss away while his underlings keep busy with the statue. It’s like surgically picking out the one mob that matters while distracting the rest. Win! I like the BrewMaster spec, I might switch over Suldrun (on Gorgonnash) over to it to replace WindWalker. After hitting iLevel 630, Glynneth became eligible to join the guild for a real raid. Not that LFR easy-mode stuff. 😉 I jest because as I mentioned earlier, I kinda like LFR and have plenty of fun in there. The guild started out trying some heroic-mode fights, which I didn’t join for. But after that wound down, they opened up to more players so I squeezed in as an extra healer for Brackenspore and Ko’ragh. I had done both via LFR but I knew the “real” fights would be tougher. As it turned out, they were much tougher. We wiped once on Brackenspore but downed him the next time around. It was pretty hectic and I’m probably the lowest geared player in the raid, but I did have a lot of fun. Even better, since everybody else was decently geared, I walked away with a nice upgrade: spaulders (shoulder armor) of item level 655! My item level jumped from 630 to 634 after that fight – awesome. Now my lagging gear is just three pieces: helm, belt, boots. Since I have a Tannery at my garrison, if I also get a better necklace, ring, or cloak, I can swap out that item out and craft a replacement at the Tannery. Essentially I’ll be hoping for a helm, belt, or boots as a direct replacement; or a necklace, ring, or cloak as an indirect replacement (any of those items will replace one of my current crafted pieces – limit of 3 in WoD). I haven’t quested much lately, just a bit on Suldrun to complete one more step of the Nagrand storyline. I quested some on Aurora, my druid, and hit level 39. It’s tense for me, questing on a PvP server. Simple things like opening the map and figuring out where to go, or reading the quest text, are risky. 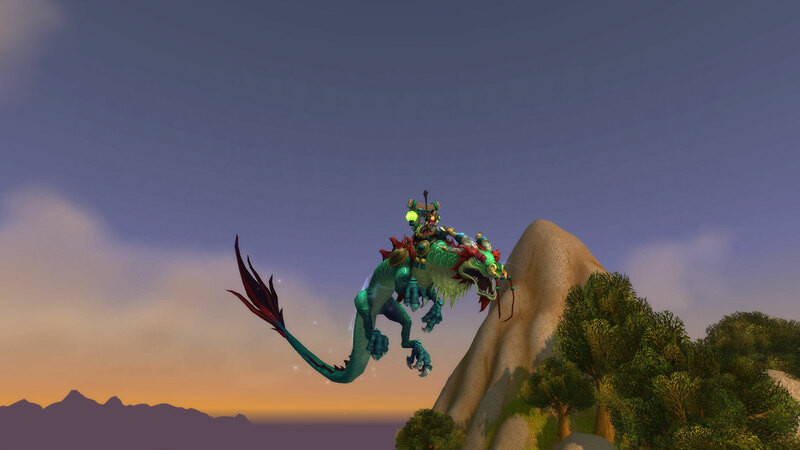 It’s a little nicer on the druid, since I can stealth and do some recon or hide, but it isn’t perfect as a flying high level char can still drop in from above and one shot me. I have 3 friends on Gorgonnash, but only one of them is really around right now: one joined a raiding guild, another hasn’t logged in much since WoD released. I also have 2 friends on Earthen Ring, and both seem very active as their guild is bigger and they are raiding in High Maul. Earthen Ring is an RP server. I’m not sure how much RP actually happens, but the key thing there is RP servers are a variant of normal PvE servers. Those server rules would be much more enjoyable for me to play under. After thinking it over for a bit, I decided to boost another char on Earthen Ring. And I chose another monk. I enjoy the class! Having the flexibility between DPS, tank, and healing is great. On a PvE server, I won’t miss stealth since I won’t be flagged PvP unless I do it by accident (typically by wandering too close to outpost guards). I’ll have more fun questing/leveling in general, since I wouldn’t be a potential target all the time, wouldn’t have to deal with what I believe is a broken PvP design (I could rant for a while on WoW’s implementation) and the Earthen Ring guild appears large enough for raid attempts. The guild on Gorgonnash consistently has 4-6 people logged in, which is more active than guilds in other MMOs I’ve played, but 10-12+ is the magic number to start raiding. While I have plenty of fun doing dungeons (5 man content) I’d like to have the option to join in raids with my guild. I could just transfer Suldrun over, but I want to have a presence on Gorgonnash too so as to continue playing with that group. I’m used to playing at least two characters in every MMO, so this would be similar to that except the two chars would be on different servers. By choosing the same class, no matter who I play I’ll be working on my “monk” skills, be they tanking or healing. Oh that’s another thing, I’m going to level on Earthen Ring as Brewmaster (tanking spec). The boost would save me from leveling to 90 on Earthen Ring, just to get to Draenor… besides, I’ve seen that life is better as a high level char. The quests pay enough gold to allow self sufficiency and I like the garrison mechanic. I’d be able to complete the storyline in Draenor in relative peace and under enjoyable circumstances, rather than dealing with the random attacks and so on. Syp posted about how miserable it can be questing on a PvP server… I was basically where he was weeks ago but rather than transfer I’m going to boost a 2nd char. I created a Pandarian a few weeks ago, back during the anniversary celebration where every new character got mail from the “WoW Dev Team” with a pet. The pet is account unique, meaning every char created during that time gets it, but only one can add it to your collection. Every other char gets to manually delete the pet, which is annoying. Even more annoying is this Pandarian character can’t get the mail in the first place – because there are no mailboxes in the Pandarian starter zone. They were all removed to prevent cross-faction mailing. And since the mail contains a “unique” pet, I can’t delete the character until I get the mail. Basically, if I want to reuse the char name, I need to play through the entire Pandarian starter zone in order to leave for Alliance/Horde areas where I can finally get this damn mail. When I do get the mail, I’ll immediately delete the pet since it doesn’t do me any good (already received it and added it to my collection). Then, I can finally delete the char. The FAIL here is mind boggling but it’s what I’m stuck with. I’m going to have to waste time playing a char I want to get rid of in order to get an email that is useless but preventing me from deleting the char. Good lord. The other day my friend asked if I wanted to join her in LFR to do Highmaul content. I had some time so I agreed. We partied up, queued up, and entered. 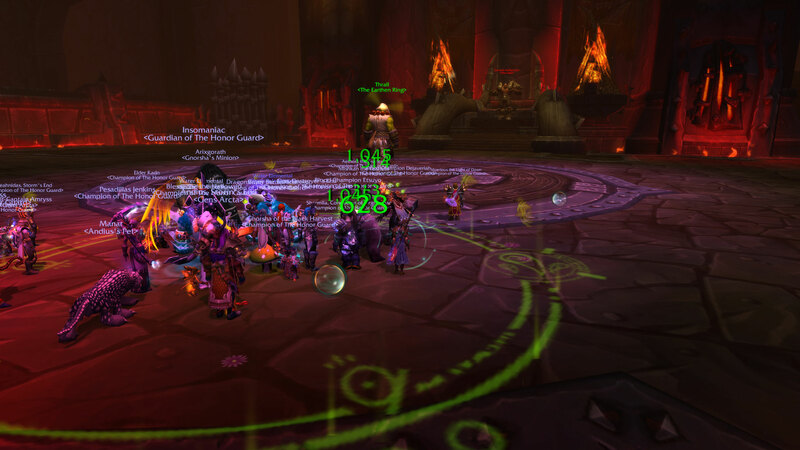 We wound up doing all the Highmaul raids LFR-style. To sum up: it was a ton of fun. I had a blast! What made it great for me was the fights were simplified. 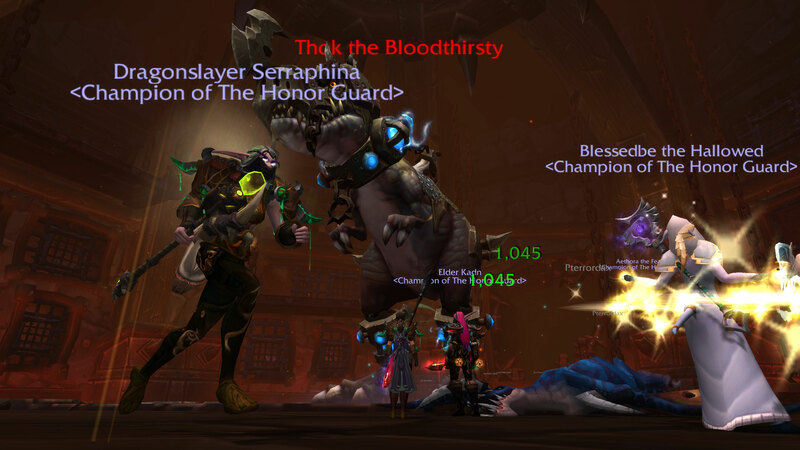 I know the elite raiders look at LFR with disdain. Actually my friend must have been slumming since her character’s iLevel is maxed out from the normal Highmaul raid – LFR is easier than the stuff her guild clears. But for me, having never been in any of it with my own character, it was great. I could get familiar with some of the mechanics of the fights and see the content. As a new healer (in WoW at least) it was much better than a 5-man because there were a few other healers. Thus, the healing “pressure” falls on more than one person, unlike a 5-man where if somebody dies the rest of the group automatically thinks the healer screwed up. So for somebody trying to get the hang of healing group encounters, LFR is fantastic in that regard as well. 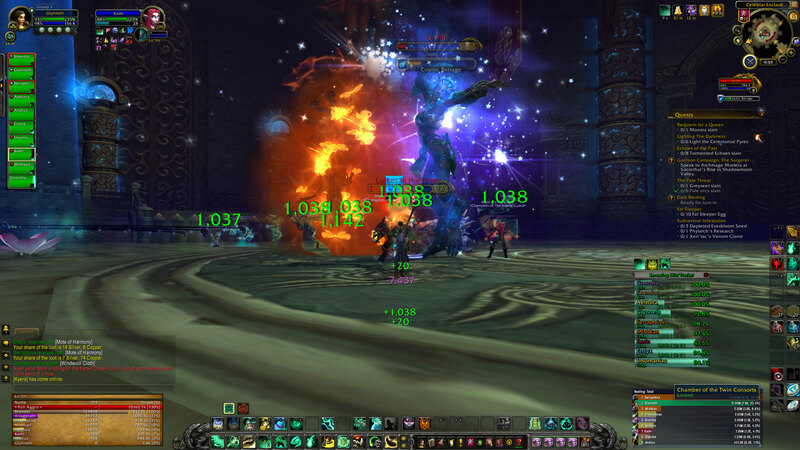 Yet another reason LFR was so fun is that each boss fight was largely in an arena-style room: a big circular room with minimal line of sight issues. For one fight, I was able to run 360 degrees around the boss for better positioning. Maybe I could have done that in the other fights – I didn’t but I don’t remember any barriers – but unlike Grimrail Depot 😉 I could find good positioning where I was in range of the players I needed to heal (more or less; I just kept the tanks in range tried to place myself between them and the majority of the others; DPS that decided to pathologically wander far away can suffer the consequences of their decisions) and then just worry about healing players and the encounter mechanics. I just used the default raid UI which was adequate, but I do plan to look into some addons like HealBot. So the advantages of LFR are numerous (easier fight mechanics; multiple other healers; fights take place in large open rooms) and I’m going to go in whenever I can (basically when the raid lock resets). As you can see in the screenshot, I ended up as 3rd healer. Basically DPS’s job is to… DPS and unleash damage into the enemies so the group wins. Unlike how “important” DPS meters are for DPS classes, healing meters/stats have some other factors at play. While more healing is better, there is also wasted healing (overhealing), mana conservation and skill cooldowns to consider – saving up big heals or big protection skills to use on the tank or to react to some encounter mechanic is very important. Topping off a player’s health when they aren’t in immediate danger of death may result in problems later due to lack of mana or a crucial skill being on cooldown. I’m not trying to claim I’m a better healer than the stats – the others had the same things to deal with – I’m just saying that topping the healing meter isn’t always the best thing for group success so maxing out healing metrics isn’t necessarily the goal. On the other hand, I likely am just an average healer (the raid has 5 healer spots, so 3rd is median), so I will use this info to compare against myself and try to get better. I’ve got skills that I don’t use much – Uplift and Chi Wave. Both have situations where they are more effective so I can try to arrange for those situations in order to amplify the effect – more healing for the mana/chi, so to speak. I can check I’m not overhealing by too much. And so on. Anyway, I’ve got room for improvement and I think having fun in LFR is about the speed I’m looking for. My other spec is Brewmaster (tank) so when I have a good grip on the LFR version of the fights maybe I’ll try them as a tank. LFR is wonderful for players like me that want a place to practice a different spec that they don’t get to do while doing regular questing. Which brings up the next section. Recently, Screaming Monkeys posted about changing things up to be less boring, making a blitz LFR. This almost certainly is written from the viewpoint of a DPS player, because I’m pretty sure healers and tanks aren’t bored even in LFR. I can see why DPS is bored – that’s all they play. Solo, group, questing, instances – do the same thing, DPS. But that is not the play style of a healer or tank – you can’t heal a mob to death, and tanking while solo… you’ve got aggro no matter what. For group content, healers and tanks fundamentally play different than they have to while leveling, due to the nature of the vast majority of MMO content, which is to become a mass murderer and kill everything to the horizon in every direction, every time you step out the safety of the local outpost. Even though it is possible to solo quest in a non-DPS spec (for me as a Monk, that is Brewmaster/tank or Mistweaver/healer in the Spirited Crane stance) you don’t really get to work on what is expected of you in group content, unless you are well, doing group content. And expecting healers and tanks to always have to group to quest and level is a non-starter. There is the Proving Grounds instance for practicing, but you can’t level there. Now I can sympathize to a degree, but I think that tuning encounters so that DPS doesn’t get bored, possibly because that’s all they play in every facet of the game, would make things WAY too difficult for healers and tanks. 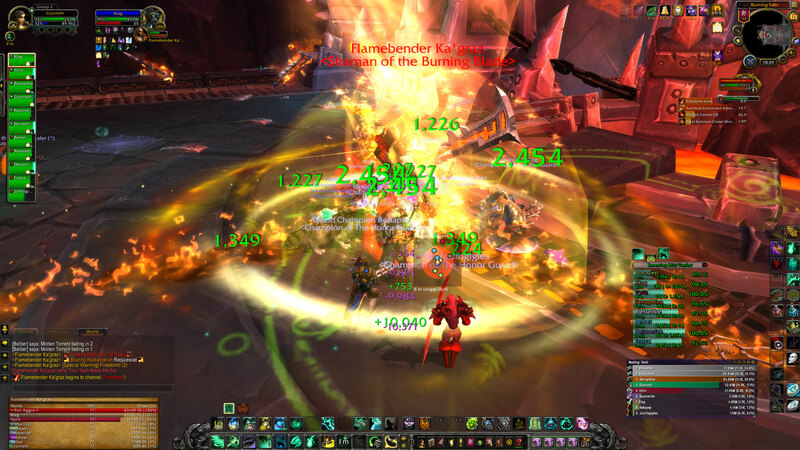 That right there is the extra challenge even the “simplified” LFR battle brings to group healers – those other players that aren’t smart enough to target the adds are also the ones standing in the fire, standing too far away, and/or generally helping the encounter kill them as quickly as possible. And for the good of the group the healers need to keep them alive anyway, or try to. Later: “as long as you have one or two decent healers and at least one good tank”. One of two decent healers? One tank? 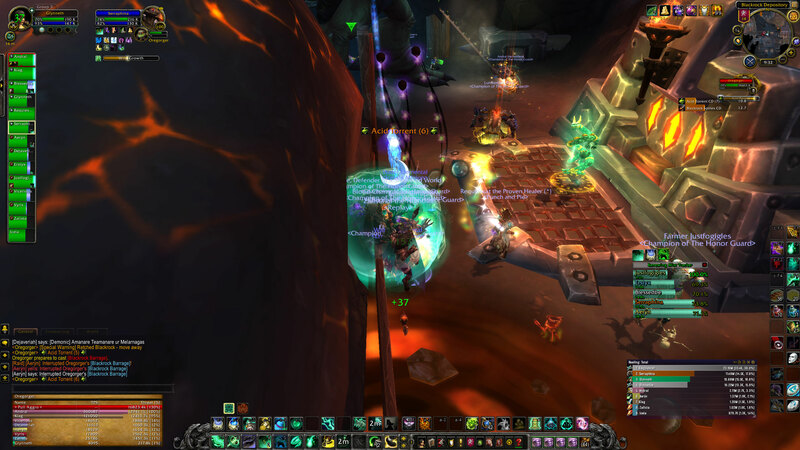 Flex raids scale 10 to 25, and I’m not sure if LFR works the same, but it probably does. 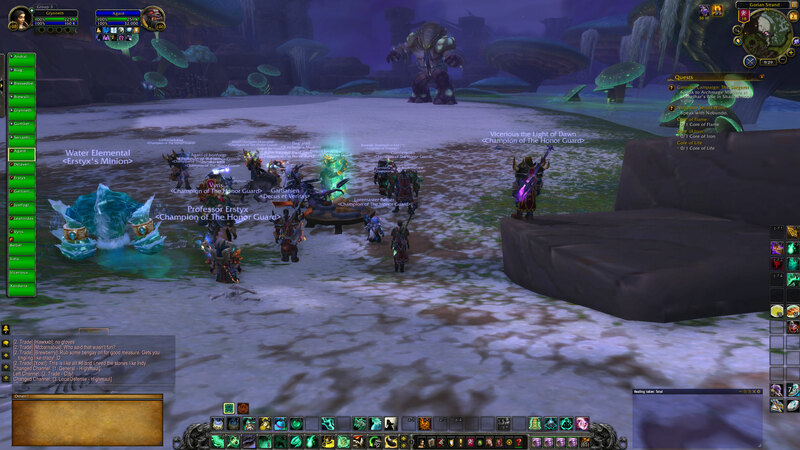 The raid above is 25 players: 2 tanks, 5 healers, 18 DPS, and you can count them for yourself in the screenshots. I am confident that 2 healers, no matter how awesome they are or how over geared they are, cannot handle healing 25 players at even leveled content. Skills don’t cool down twice as fast even if they have ninja reflexes. And their gear won’t scale up their mana and healing output 100% more. The regular content allows for groups of 5: 1 tank, 1 healer, 3 DPS. So one or two healers at that same ratio means a group of 5 to 10 players, and for a full raid it works out to 5 healers. But not 5 tanks; I suppose one handles the big boss and the other rounds up adds as best as possible. 2 healers means the tanks get healed and DPS is mostly on their own. Later: “make the fights go faster”. That depends on how it is done. Less garbage – sure. Trim boss health – sure. Compressing time so adds show up and boss mechanics fire 3 times faster (i.e. boss does something every minute, adds show up every minute; re-tuned encounter now does whatever every 20 seconds so the encounter is “faster”). No. Make boss output the same damage in less time (i.e. boss does X damage a minute; re-tuned encounter boss does 3X in 20 seconds so it is “faster”) – no No NO HELL NO!! I didn’t think my LFRs went on too long – we downed Brackenspore in under 7 mins (also visible in the screenshot courtesy of the DBM mod) which is about the goal mentioned of a 5 min boss fight. I don’t recall how long the other fights took because I was too busy keeping on top of healing to notice. 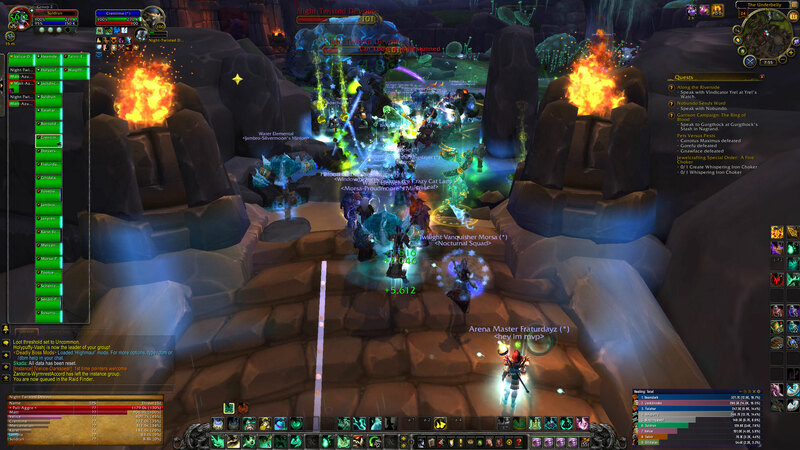 I thought the 7 min Brackenspore fight was hectic – from my viewpoint any long fight becomes a balance between various cooldowns, mana conservation, and constant triage to keep the tanks at a healthy enough margin to avoid impending death so the healers can pay attention the rest of the group. My suggestion is: if LFR is boring as DPS, try it as healer or tank. 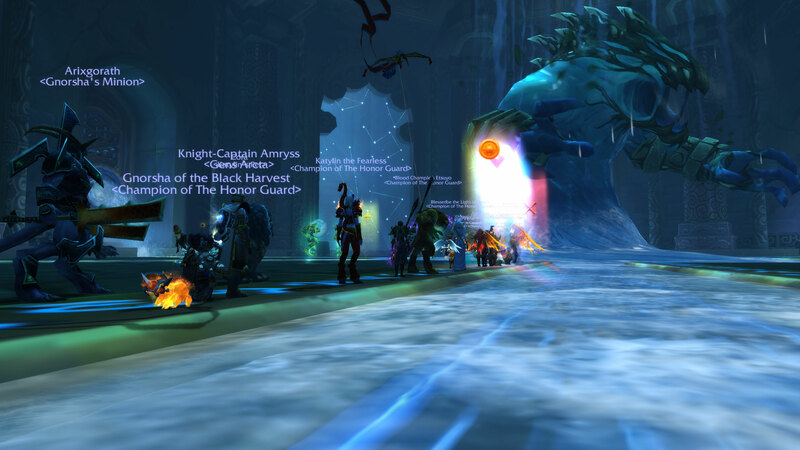 If LFR is boring as DPS, respec or play a class that is more flexible, or even better, do the regular raid. Do NOT make the LFR fight harder because DPS, as 1 of 18 or whatever, is bored. Do NOT tune the LFR fight so no DPS gets bored. Don’t screw the healers and tanks who can’t play their spec as much as DPS can.